Lost In Space Review - Family Sci-Fi Is As Tricky As It Was 50 Years Ago - Are You Screening? The Netflix update of a classic of cornball television is surprisingly fun and inventive, but has as many problems as positives, especially if you aren’t ready for an FX-riddled, Sci-Fi adventure that aims so squarely at family viewing. 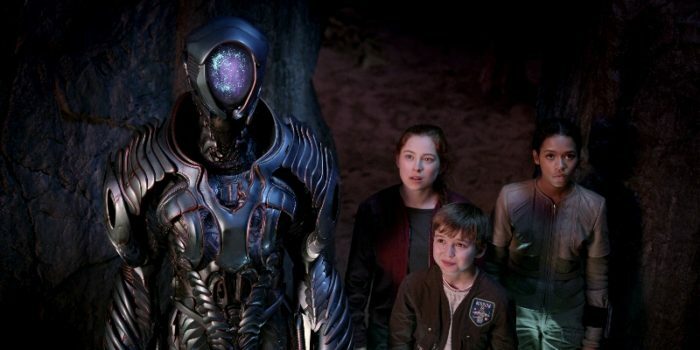 Perhaps the most curious part of the new Lost in Space is trying to figure out why it bothers to be a reboot in the first place, except that perhaps this an easy clue that it doesn’t want you to scrutinize some of the odder elements more than you would for any other family vehicle. We’re lost. We’re in space. We’re named Robinson. There’s a robot. Beyond the details of the script’s first page, it’s hard to see the similarities. That fact is further brought to light by the existence of a variety of secrets and chicanery surrounding our doctor, who is a much darker version of the cowardly fly-in-our-ointment that frequently facilitated the episodic plots. 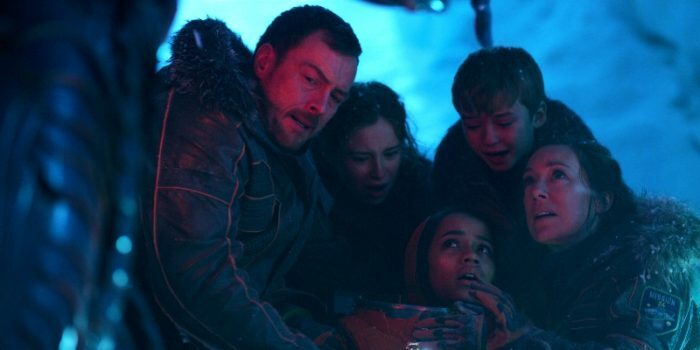 Darker is a key word for the new version of Lost in Space, and one has to imagine that it is simply a result of updating the idea of peril. The original series offered up a group of people who were “in peril,” almost exclusively by way of telling the audience that such was the case, and/or by having Dr. Smith act very scared. That isn’t going to fly today, but putting the audience in the middle of a series of far more serious predicaments makes it more difficult for the series to mesh with its efforts to work as family fare. Our kids, Will (Maxwell Jenkins), Judy (Taylor Russell), and Penny (Mina Sundwell), are headstrong and frequently a severely obnoxious sort of naive. That’s the sort of purposeful character flaw that drives a lot of tween shows on the Disney Channel, but those characters don’t routinely run into monsters, or find themselves seconds from running out of air. It isn’t an impossible combination, but it’s a dangerous one, and put together with certain last-second escapes and ludicrously improbable flying, the show doesn’t hit that strongly right out of the gate. That said, this bizarre mix of talented actors and odd circumstances is a lot of fun so long as it’s viewed as the family adventure it is. Toby Stephens and Molly Parker, underappreciated as they are, probably don’t provide the kind of draw that is actually in line with their abilities, but manage the difficult task of driving the overall story while often taking a back seat to their children, who are really the focus of most of the initial episodes. Once we get to extended time with just the parents, they easily pull you into their own perspective in a way that the one-off jabs at each other during the establishment phase might have made seem impossible. Curious as that may sound, the point is that the ability of the characters to win through here is a triumph of actors over their material. The whole show, and viewers’ connection to it, may hinge on Parker Posey (doesn’t everything). Dr. Smith is a very different character here, though she might easily be a descendant of the original, and much as Posey can pull off just about anything you want, the series may ask too much of her. She is both dark and deadly, and something of the original cowardly buffoon, which isn’t a mix that has any way to coalesce. Whatever problems the show may have, most of them are legitimately written off as genre concessions, and they aren’t too much to keep the action moving in any case. Where it strives for depth over “theme park ride,” it struggles to develop the follies of youth instead of stereotypical brat behavior, but it’s at least interesting depth it’s missing. If you’re surrounded by at least two people under 15, this is one of the best shows in quite a while and one of the only adventures that everyone will enjoy. If you aren’t, I’m not sure how much it has to offer.